After spending so many hours researching different fairway woods and technologies around the specific club, I feel I’m ready to share my insights and nerd out a little bit with numbers. To write this article, I’ve not only just looked at what the best fairway woods are right now, but I hope that this is a complete buyers guide where I’ll share some things to look out for and consider as these are quite relatively new and rising in popularity. What Is The Fairway Wood Used For? What Shaft Should I Go For? Can I Buy an Offset Wood? What Loft Should I Go For? Many golfers choose to hit fairway woods rather than long irons on the fairway because the larger clubhead makes it easy to achieve greater distance. However, this is not the only reason players choose to have a fairway wood in their golf bag. The first thing you must do when choosing the right fairway wood is decide how you are going to use the club. To replace long irons on the fairway is the top reason golfers have a fairway wood but some prefer to use them off the tee instead of a driver. Fairway woods do not go as far off the tee as a driver but are easier to hit. If you decide you want a fairway wood to replace your driver, you will need to choose a 2,3 or 4 wood. If you want to replace your 2, 3 and 4 iron with a fairway wood, you will be looking at 5 woods and above. You can replace a 2 iron with a 5 wood, a 3 iron with a 7 wood and 4 iron with a 9 wood. If you are getting close to reaching par-5 holes in two but cannot quite get there on the second shot with an iron, you should opt for a 3 or 4 wood. Once you have decided what you want to achieve when using a fairway wood, you can begin to look at the finer details. Beginning with the shaft, the majority of fairway woods now come with a graphite shaft. There are some which still offer steel but a graphite shaft is lighter and will generate the height most beginner and amateur player require. If you want to keep the ball lower, you will need to consider a steel shaft. Some manufacturers will offer a choice of neutral, offset or draw for the head of the club. A weight is placed inside the clubhead to help keep it square when contacting the ball. This is great if you have analysed your game and know exactly what you need but when purchasing your first fairway wood, you are advised to start with a standard version. An offset head is not always the best choice if you have a swing problem, so to choose the right fairway wood you are advised to pick a standard model. Some fairway wood manufacturers include an adjustable hosel and this allows the loft of the club to be changed. You can increase and decrease the loft of a fairway wood, usually by as much as 5 degrees and how you set this will have an impact on ball flight. Choosing a fairway wood with an adjustable hosel will allow you to set-up the club so you can get exactly what you want from it on the fairway. If you are anything like me then you have probably not considered club fitting and stuck with the typical loft of 15 degrees. I see a lot of this with golfers who use their three wood and it might not always be the best loft option. When I went to my first fitting, I must say it was pretty overwhelming especially having your swing analysed to every single bit of detail. I won’t go too much into this but when it comes to fairway woods, there’s a lot of things to take into account like angle of attack, launch angle, carry and spin rate. In a nutshell, you are trying to get the clubface as square as possible to the target. Now when you are changing the loft of the club, you are essentially changing the way the club face interacts with the ball on contact. So, by removing some of the loft, you are bringing the centre of the face closer to the golf ball on impact which is helpful for you golfers who are catching the bottom of the club. Obviously, the opposite is true by adding some loft. My biggest worry is when I see new golfers with loft of 13 or 14 degrees because new golfers may not have the ball speed to support that loft and get the ball in the air. So, it’s not easy picking the right loft for your club and I can’t tell you what the best loft is because each swing is different. I personally have always preferred a 14.5 loft but someone with a much higher ball speed would prefer a 13.5 loft so that they are able to get better contact on the ball. It can also then come down to how you are using your fairway wood during a round. If you are using your fairway to come into the greens then you can set up your loft so that the ball will stop and not have as much carry. But then the opposite might be true if you are playing a course which has bunkers or a rough front, you will need that ball to carry and the loft that you have set can affect this. There’s so much to talk here but hopefully I’ve given you some basics into what to consider when you are adding to add one to your bag. However, despite applying the information above, nothing beats trying out a few different fairway woods and seeing which one works best for you. So let’s dive straight in and see what the top rated fairway woods are this year. For those who have used any of the recent Callaway drivers, you will have heard of their Jailbreak Technology. This has not been introduced into all their fairway woods but Callaway could not resist but introduce into the Callaway Rogue Fairway Wood. 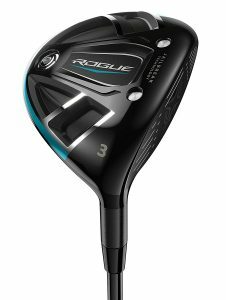 The Callaway Rogue Fairway Wood looks very nice, with an average sized head and a slightly taller face which makes it good for using off the tee. The black colour and rounded head design make the club look very smart and it certainly stands out from many others in the style stakes. There is also a chevron alignment aid on the crown of the Callaway Rogue Fairway Wood which draws your attention nicely to the ball. In terms of distance, when you connect with the centre of the face you will think you are using a driver, it is that good. Even shots off-centre travel a good distance when using the Callaway Rogue Fairway Wood and you will not believe the ball speeds you can achieve when using this club. The sound off the face of the Callaway Rogue Fairway Wood is not great and a little ‘tinny’ but that does not detract from the overall performance. All this plus the extra forgiveness make the Callaway Rogue Fairway Wood a top club. When buying the Callaway Rogue Fairway Wood, you can select from four shaft options with various weights and several lofts to tailor the club to your own requirements. It doesn’t come cheap but does come highly recommended. The Taylormade M4 Fairway Wood has been labelled by TaylorMade as their ultimate distance fairway wood but does it deliver on that claim? 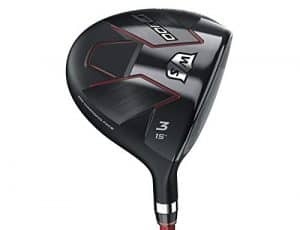 The Taylormade M3 Fairway Wood was rated by many as the best available and therefore, TaylorMade have decided not to change too much when releasing the M4. The club has been created from the same materials and perhaps the major difference comes thanks to the inverted cone design of the head. This is said to increase ball speed off the face of the club and make it more forgiving with the increased overall size of the head. The internal weight pad, which was a single pad in the M3 has been split into two on the Taylormade M4 Fairway Wood. This has also been done with increased forgiveness in mind. There is no adjustable hosel or sliding weight which was seen in the M3 and the only customisation aspect of the Taylormade M4 Fairway Wood is the loft. The club is available in five head lofts of 15°, 16.5°, 18°, 21° and 24°. In tests, the Taylormade M4 Fairway Wood does live up to their claim of ultimate distance. It resulted in longer shots for both professional and amateur golfers, with the latter hitting the ball 5 yards further on average in terms of carry compared to other fairway woods tested. With maximum distance and increased forgiveness, there is nothing to dislike about the Taylormade M4 Fairway Wood. 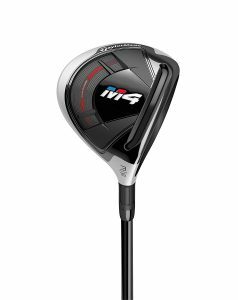 If you are looking to invest in a new fairway wood, the Taylormade M4 Fairway Wood deserves serious consideration. The original Callaway Steelhead fairway wood collection was hugely popular and they have been revived by the company thanks to the Callaway Steelhead XR. The Callaway Steelhead XR comes in a new, light-weight J-36 carbon crown and the weight saved by using this crown has been distributed to great effect elsewhere in the club. Perhaps the main benefit is the optimal centre of gravity position and this has been optimised in addition to the enhanced perimeter weighting which gives the Callaway Steelhead XR more forgiveness. The Face Cup technology used in the Callaway Steelhead XR generates faster ball speeds across the face and this can produce more distance on shots. The Hawkeye sole design promotes an easy launch of the ball from the fairway and provides plenty of versatility to play shots from different lies. The bonded hosel design is available in various lofts including 13.5, 15, 16, 18, 20.5, 21, and 24 degrees so you can try and buy the Callaway Steelhead XR which is best suited to your game and requirements. While the Callaway Steelhead XR may look similar to the previous edition of Steelhead fairway clubs produced by Callaway, the changes in design above make it a superior club and that’s saying something. The several upgrades in technology have seen the Callaway Steelhead XR move on from the earlier editions in the mid 2000’s but they remain one of the top fairway woods on the market. Founders Club may be a new name to many beginner golfers and even for experienced players, this may be a golf manufacturer which is new to you. However, Founders Club have designed some excellent golf clubs, none more so than the Founders Club Fresh Metal and they are popular among players aiming to develop their game. Their fairway woods have been designed to give players of all abilities the opportunity to hit high, long and consistent shots from various ball positions. It does not matter if you are playing from the fairway, the tee or the rough, the Founders Club Fresh Metal have been designed to make the shot as easy as possible. If you have problems with slicing the ball, which is a common fault among golfers, the Founders Club Fresh Metal will help to cure the problem. They do this by promoting a high drawing ball flight which in turn increases both distance and control. The Founders rails and easy lie sole combine to make addressing the ball comfortable and this breeds confidence in the shot. The Founders Club Fresh Metal are available in low torque graphite shafts in regular or senior Flex but are for right handed players only. Coming in at a very competitive price point, you will struggle to find better value for money than the Founders Club Fresh Metal and they have proven to be very popular, earning great reviews by users online. The Titleist TS3 Fairway Wood looks superb on the shelf, with a classic head and black finish immediately drawing the eye. The overall design of the club is similar to the Titleist 917 with a steel crown and the features above but that is there the similarities end. 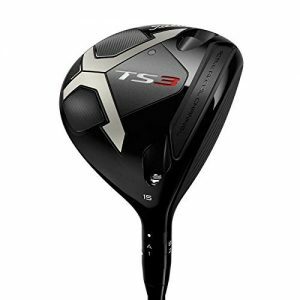 The face of the Titleist TS3 Fairway Wood is both thinner and lighter and the weight has been moved further back and lower to increase the moment of inertia. The ARC slot, which is found in the sole has been made taller and filled with polymer which allows the Titleist TS3 Fairway Wood to glide across the ground smoothly plus improve the speed and launch of the ball. The club includes SureFit CG weight technology and this is a small cylinder which slots into a tube in the sole of the Titleist TS3 Fairway Wood. There is a range of weights you can test at a fitting session and the weights can be adjusted to suit your swing. The weight comes with a magnetic head and this can be placed on either side of the cylinder to make one side heavier than the other. This helps in promoting a fade or draw shot. The Titleist TS3 Fairway Wood is great for those who like to change their set-up to play specific styles of shot. If you have an above average swing speed you are sure you love using the Titleist TS3 Fairway Wood but those with slower swing speeds may struggle to see the benefit. The Wilson Staff D300 Fairway Wood has not been described as a fairway wood by the manufacturers. In fact, Wilson call it a driver and they say, ‘The D in D300 not only stands for distance, it defines it. The newly designed D300 driver combines Right Light Technology with Micro Vortex Generators to reduce the drag force leading to increased club head speeds and greater distance’. Perhaps the first thing most golfers will notice when using the Wilson Staff D300 Fairway Wood is the pattern on top of the club head. The Micro Vortex Generators have been designed and placed on the crown of the club to disrupt airflow and reduce friction and this makes the head go faster. You will notice the head of the club is quite short in comparison to other fairway woods but remains wide. The face is the same matt black colour as the head and some users may find this difficult to see, especially with no alignment line. The Wilson Staff D300 Fairway Wood feels very light and this helps when generating clubhead speed. The carpenter 455 steel face has been designed to allow players to use the club in a variety of situations including off the tee, on the fairway and from the rough. However, the Wilson Staff D300 Fairway Wood will divide opinion between club golfers. Some will love it while others will not produce the distance they are hoping for with a club which has been designed with that purpose in mind. That being said, if you are looking for a versatile fairway wood, the Wilson Staff D300 could still be a good choice. The Callaway GBB Epic Fairway Wood is in keeping with the other clubs in the Callaway Epic range in that it features a black and lime colour scheme. The head of the club is a little larger than the average fairway wood and the face is deep, which promotes loft and forgiveness. The larger clubhead will give most players increased confidence when using the Callaway GBB Epic Fairway Wood and the club feels light. The Callaway GBB Epic Fairway Wood can be used with very little effort yet you can always feel the clubhead throughout the swing. The Jailbreak Technology found in Callaway’s drivers is absent in this club and despite feeling a little hollow at impact, the distance achieved off the centre of the face is fantastic. Playing shots off the ground, the Callaway GBB Epic Fairway Wood is forgiving and easily launches the ball into the air. Despite being easy to launch, there is plenty of distance to be had out of this club. It may be a little too lofty off the tee for some players but playing from the fairway, the Callaway GBB Epic Fairway Wood is a club to be reckoned with. If you want a fairway wood which in stills confidence in your game, this could be the one. Much like the TaylorMade wood discussed above, the Ping G400 Fairway Wood has not changed a great deal from the previous version of the club. The Ping G Wood featured a very similar head shape as the Ping G400 Fairway Wood, with the main difference being the Turbulators, which are found on the crown. These are more prominent on the Ping G400 Fairway Wood than the Ping G and this improves the aerodynamics of the club. They have also proven very useful for alignment and the ball sits perfectly in the centre of the face, between the two middle Turbulators. The moment of inertia has been improved in the Ping G400 Fairway Wood by reducing the thickness of the steel crown and shifting the weight further back in the head. The groves have been painted on and this allows the face of the Ping G400 Fairway Wood to remain thin while the base is flatter than previous versions which allows the club to sit closer to the ground. This is great when trying to get the ball up from tight lies. The Ping G400 Fairway Wood comes with an array of loft options and adjustable hosel, making it a good choice if you want to refine your club. In fact, the adjustable hosel makes the Ping G400 Fairway Wood a great club to fill in the yardage gaps within your current set of clubs. This first thing to mention about the TaylorMade RBZ Black Fairways is the colour and design, which is fantastic. As the name suggests, these fairway woods come in a satin black finish and everything on the head is black, other than touch of yellow on the sole plus the alignment mark and brand name, both of which are in grey. The TaylorMade Men’s RBZ Black Fairways not only look the part but deliver the goods on the golf course. The ‘revolutionary’ Speed Pocket, which is located in the sole of the club, helps to promote ball launch and increases distance. This is not the first time we have seen the Speed Pocket in a TaylorMade club and it certainly reduces the amount of spin on the ball. The TaylorMade Men’s RBZ Black Fairways feature a shallower profile and this lowers the centre of gravity to promote better playability off the fairway. The mass pad assists in generating a lovely sound when making a good contact and increases the level of feel, even when striking the ball slightly off centre. The black face of the TaylorMade Men’s RBZ Black Fairways provides instant feedback by leaving an impression as soon as the ball has left the club and for many players this is invaluable. 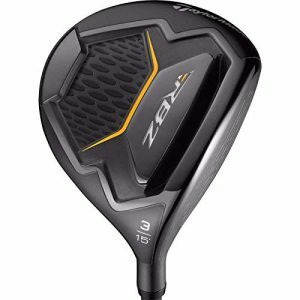 Coming in a choice of 3 Wood, 3HL Wood and 5 Wood, the TaylorMade Men’s RBZ Black Fairways have received rave reviews from all who have used the clubs and is fats becoming the ‘must have’ fairway wood for players of all abilities. The Titleist Men’s 917 F2 Fairways match the TaylorMade Men’s RBZ Black Fairways in terms of colour and if you like to look stylish on the golf course, the Titleist Men’s 917 F2 Fairways will not let you down. The woods feature a new SureFit CG system which has allowed the centre of gravity to be moved without compromising on forgiveness. The Titleist Men’s 917 F2 Fairways come with interchangeable weights and these are neutral, draw and fade. They each have an impact on the style of shot you can play and weigh 14 grams but these can be changed for different weights to match your swing if required. The options do not end there and the Titleist Men’s 917 F2 Fairways SureFit hosel means you can adjust the loft and lie angle to suit your swing and produce the launch you desire from the club. This in conjunction with the new Active Recoil Channel 2.0 helps to increase speed and lower spin, generating more distance off the face. The Titleist Men’s 917 F2 Fairways are suitable for mid-to-high handicap golfers, thanks to the great combination of performance and forgiveness. The customisation options allow you to set-up the club to your requirements in terms of weight, balance and loft and that makes the Titleist Men’s 917 F2 Fairways a standout performer for golfers who want a tailored fairway wood in their bag.